ABOUT THIS INTERVIEW: On this date, the Beatles arrived in Maryland for their performance at Baltimore's Civic Center. John Lennon was interviewed by Larry Kane as part of an on-going series of interviews with the group. 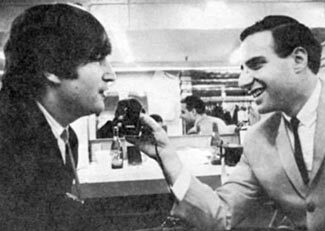 Kane was the only American reporter allowed to travel with the Beatles during their 1964 North American tour, and also accompanied them on their 1965 tour. Larry Kane has authored the insightful books, "Lennon Revealed" (2005) and "Ticket To Ride" (2003) documenting his conversations with the group and also his first-hand accounts of behind-the-scenes events as they happened. Q: "John, occasionally we see magazine articles, like last night, one that had your name as 'Jack Lennon' and all these irregularities. What do you think of this when you look at them?" JOHN: "Well, I just think the people are stupid, you know, if they're not gonna bother to take enough time to do a job and find out what our names are... and try and get the facts right, you know. They must be a bit soft." Q: "There are alot of people who have albums out with your music on it, like this 'Chipmunk' album, and the 'Boston Pops.' Do you find this a credit to you, or an abortion of your songs." JOHN: "No, we enjoy it! We always try to get a copy of these people that do our songs. The thing about the 'Chipmunks' and the 'Boston...' they do it so differently from us and from each other-- it's very interesting. And also we, Paul and I, get alot of money when they make these so it's very good for us, you know." Q: "There is a cut in it for you when they do record these songs." JOHN: "Yeah, 'cuz we compose them, you know, so we get the... a good lot of money." Q: "John, when you were in New York, what did you like best about it?" JOHN: "I just like cities, you see, and preferably big ones. That's why I liked it. And we met some good people like Bob Dylan and Joan Baez, you know, and I enjoy meeting people I admire." Q: "Do you like to play better indoors or outdoors?" JOHN: "Indoors. I don't like playing outdoors. You can't hear and you get blown to pieces." JOHN: "Oh! That was dreadful!" Q: "John, any particular reason that you chose the songs that you did for the current concerts?" JOHN: "We took a sort of aggregate of the most popular ones in the States over the last couple of months." Q: "Your early songs and your latest songs." JOHN: "Yeah. We missed-out alot of the earlier ones, like uhh... I can't think of any, but I'm sure we missed some out." Q: "There's so many rumors going around and one of the jobs I like to do is either to confirm them or dispel them. There's a big rumor in alot of magazines and papers that you're coming back (to America) in January." JOHN: "Well, I don't know... might be true. I haven't a clue. Nobody's told me if we are, you know." Q: "Everyone asks what you like... What's your pet peeve? What is the thing that you dislike the most in the world?" JOHN: "Having things thrown at us on-stage. Jellybeans and rubbish and that." Q: "This is your pet peeve in your whole life." JOHN: "Yeah, 'cuz it hurts." JOHN: (giggles) "You can't carry on singing and laughing with things hitting you." Q: "How many other instruments do you play if you play any?" JOHN: "A bit of piano, and a bit of mouth organ." Q: "Have you played the organ... umm... mouth organ on any of your songs?" JOHN: "Well, all the... yeah. There's quite a few we did with mouth organ. I played it on the early hits-- 'Please Please Me,' 'From Me To You,' 'Love Me Do,' 'Little Child' from the LP, 'I Should Have Known Better' on the film-- I stuck mouth organ on that." Q: "When you're over here, do you miss England? Do you ever get a little homesick even though you're achieving great success over here, and you're having some good times?" JOHN: "Oh yeah. You get homesick, alright. Every other day (laughs) only!" Q: "What about the gifts? I notice more and more you've been getting more and more gifts from fans. What was the most unusual gift you've ever received? I know there's so many-- Is there one that sticks out in your mind?" JOHN: (laughs) "I once received a bra..."
JOHN: "...with 'I Love John' embroidered on it. I thought it was pretty original. I didn't keep it, mind you-- It didn't fit." Q: "How did you like Key West?" JOHN: (jokingly) "It was alright for a swamp. (laughs) No, it wasn't bad, you know." Q: "When you're out there, you do alot of lead (vocal) on most of the songs. Have you ever had a point during your concerts where you ever had a loss, a mental-block in your head as to what to do next?" JOHN: "Yeah. I'm the one that often gets it-- suddenly go blank and I don't know what I'm singing or playing or anything, you know. I just forget, and all the rest sort of tell me what's happening." Q: "You mentioned these jellybeans and everything. Does it hamper your work... besides making you frightened of the fact that it might hit your eye or something... does it hamper your work?" JOHN: "Yeah. You can't play if they keep hitting you, you know. You keep stopping 'cuz it's natural-- you sort of duck, you know, and you stop playing. But it's been quite good-- it's stopped now. So I suppose we should stop talking about it." Q: "Here's a question alot of people will think it kind of ridiculous to ask entertainers this, but I'm going to because alot of people are interested in your opinion. So much of these world conflicts going on-- everybody's fighting each other. What would be your personal solution to stopping war? What way or method?" JOHN: "I don't think there is one, you know. Not if everybody was all rich and happy, and each country had all they wanted, they'd still want the next bit. I don't think there'll ever be any solution... only, just, you know, a sort of power block where everybody's got the same weapons." Q: "There was a big rumor out around the country-- as you know there's so many rumors-- about Ringo having a throat operation. And this was cleared up last night with this 'tonsil' bit." JOHN: "Yeah, he's having his tonsils out when we get back to Britain, then go after the British tour." Q: "Has there ever been one rumor that's particularly peeved you?" JOHN: "Umm, me leaving the group... and my wife being pregnant." Q: "You mean, having a baby next month?" Q: "There's been alot of criticism by Americans of the fact that there's so many groups that are coming out that have no originality, from England, that are all trying to copy you. Now we know there's a handful that are really doing very well over here, as well as you..."
Q: "...Does it ever bother you that certain groups will copy you completely whatever you do?" JOHN: "No, because everybody knows, you know. Only the dumbest people don't know that they're copying us, you know. So it's just a laugh when you see a big imitation of you going 'round. They never really make it. They might have a hit, but nobody's fooled for long." Q: "Does anybody ever ask you for advice-- another group, let's say?" JOHN: "Younger groups, you know, that are just sort of forming. But there's no advice you can give really. Just keep playing and hope for the best." Q: "I notice that you have this guitar with you, and I notice you strum it quite a bit. Where do you get your ideas for songs? Do you ever get them sitting in a dressing room, or in a hotel room? Is it a planned session, or do you just come across an idea?" JOHN: "No, I just come across one. I could happen any minute... (strums wildly and yells) Noww-yyo-oumpfff!!! You see... like that!" Q: (laughs) "Have you written any on this current tour?" Q: "You don't have the names or anything like that?" JOHN: "I know the names, but we don't give them 'cuz people turn out songs with the same name, you know." Q: "I'm not that familiar with the music business, myself." JOHN: "Well that's what happens. You think of a name that's original, and you broadcast it, and somebody will make a record with the same name and a different song. And it gets confusing, you know." Q: "When you first came over to this country in February and I met you briefly in Miami, were you shocked by the reaction? Were you worried about your reaction over here, personally-- the crowds and everything else?" JOHN: "Well, we never expected to... didn't expect to sell records or anything over here. So we were just amazed. (giggles) And we still are, you know." Q: "Was the American market your main goal after conquering England"
JOHN: "Yeah, well, every British artist used to imagine trying to get... you get the odd hit from Britain, or you get the odd hit from Germany-- there's alot of freak records. But nobody ever sort of made it in America, and we were dying to be the first." Q: "I know there's a record over here of 'I Want To Hold Your Hand' in German, or 'She Loves you,' one or the other." Q: "Have you done them any other languages"
JOHN: "No, the Germans are the only ones that won't buy you in English. You have to kow-tow to the Germans. But after you've made a couple of records they'll buy anything." Q: "I know the police have generally done a great job on this current tour, but what do you think personally about some of them trying to get autographs and going out of the line of duty? You know, you've seen so many of them come back in the plane-- and to me, this may be a little strong, but it's sort of a bribe. What do you think of this?" JOHN: "Well, some of the police do sort of-- 'You sign this or we won't help you' but most of them are just normal fellas, and you get sort of lousy people in any organization. You get a couple of lousy cops who sort of threaten you or... not threaten you with violence, but sort of 'Unless you sign me eighty of these I'm not gonna look after you.' But they're no worse than any people in any organization. You get bums everywhere." Q: "This is your first tour that you've actually seen all of America, and up to now you've seen about every section. Off your role as a performer, what do you think of America as a country-- the cities and the land and the people?" JOHN: "I think it's marvelous, you know. I like it, and especially places like New York and Hollywood, you know. I like the big places. And it's amazing to see a place like Los Vegas. Who ever thought of building a place in the middle of a desert, (giggles) you know. Things like that are marvelous." Q: "Do you ever have any differences on-stage or off-stage?" JOHN: "Off-stage are the same differences that normal people have or friends have, you know, but they're never violent or they never last long. We always settle our argument, you know." Q: "Everybody says you're gonna break up. This is another rumor. It's all over." JOHN: "That's alot of rubbish, you know. It's just rubbish. We've never even thought of it." Q: "We were reading those fan magazines, and I plan to show you a few more because some of them are unbelievable." Q: "I don't know who prints them. I know you laughed when you saw the name Jack Lennon on the page the other night, and I laughed too. Has it ever really bugged you that they get your name wrong?" JOHN: "No. It's always made me laugh when people get my name wrong. Like, there was one DJ today who said, 'This is so-and-so from so-and-so station, talking to John Harrison here,' and I just creased up but I never told him, you know. He found out by himself at the end. But it's just funny, you know. If they can't get your name right, well, (comical voice) God help 'em, that's what I say!" Q: "You talked about playing in-doors and outdoors. I noticed the other night, even though you had a forty mile an hour, or thirty mile an hour wind in Jacksonville-- I don't know if you knew it was that high..."
JOHN: (giggles) "It felt like a hundred mile an hour one to me." Q: "...you still didn't have any trouble getting out the song. Do you try to acclimate yourself to this, or did it really bother you the other night?" JOHN: "Yeah, you know. We'd never been through a thing like that. We were most sort of awkward with... all our hair was blowing up-- we all looked like four Elvis Presleys or something. (giggles) We just felt uncomfortable with all that wind." Q: "John, thank you very much. It's been nice working with you." JOHN: "Great working with you, Larry."